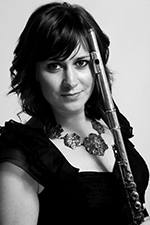 Eliza Marshall played flute with the Millennia Ensemble on the albums Victory For The Comic Muse and Forverland. She has also played for other pop artists such as Travis, Peter Gabriel or Katie Melua; West End Shows; classical ensemble and has performed works by Joby Talbot and John McCabe. Eliza also runs her own monthly Classical Music Concert Series – The Little Proms; and is one of the founders of The Korros Ensemble and Ranagri.